In one respect, Husman's current bag designs are just what is required. Each flavor is color coded. The flavor is written large and dominantly in the centre. The logo is traditional. From a design perspective however, it is nothing if it's not original or innovative. The Wavy Rippled nature of these Kettle Potato Chips produced a much crisper crunch than Husman's regular Chips. This could be down to the additional thickness, but it was certainly at least in part because of the design of the Chips. Medium width Ridges, hence the 'Wavy' description. Most of the Chips kept their dippable shape and were whole. 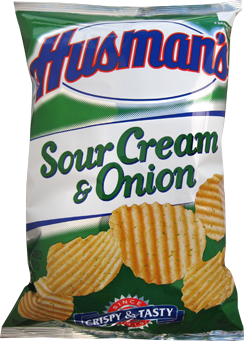 The style of Chip also meant that they were slightly thicker than Husman's regular Chips. There was less visible oil and although there were some flecks of seasoning it was minimal. A creamy, balanced onion flavor was a little bit of a surprise after the Nose Plunge Test, which revealed a slight onion aroma. They were a little salty creamy, but the onion powder shone through as well. They were enjoyable but they may have been helped on their way by the unnecessary monosodium glutamate.